Less than a month ago, large parts of southern California were on fire. In one community, some of the victims were the firefighters themselves. A newspaper headline read: "Firefighters Lose Homes While Saving Others." Instead of rushing to their own homes, they remained on the lines – protecting and saving many others. For The Early Show's American Heroes series, meet the men and women of the Cuyamaca Volunteer Fire Department. Even veteran firefighters say they have never seen anything like it. Firefighter Rachel Goddard says, "I still dream of it. Close my eyes and I can see houses going up. It looked like Armageddon." Firefighter David Southcott says, "It was the scariest fire I've ever seen in my LIFE!" And in the aftermath of this fire near San Diego, virtually an entire town lay in ruins. Battalion Chief Carl Schweikert, pointing at a map with 25 black marks, says, "All the black marks are structures that are still standing." 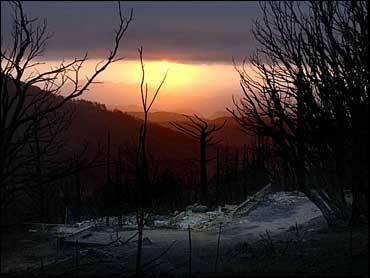 Which means all the other homes, about 80 percent of the mountain community, are gone. Cuyamaca has eight volunteer firefighters. Seven are now homeless, including Schweikert. Picking up a big chunk of metal, he says, "That's what's left of a steel roll-up door." He also lost his business, an auto repair shop. Schweikert says, "When you've got a wall of flame looking at you, you're so focused that injuries, your home, you don't think about that. When we sat down, it started to sink in, that you know, chances are, we didn't have homes. Unfortunately, we were right." His neighbor Lorraine Ledezma notes, "I think it takes a special person to be a fireman." Ledezma's was one of the few homes spared. She says, "I thank God for those men and women who have the courage and, you know, they really are heroes." Karen Dunbar says her home was saved when firefighter David Southcott rushed in to activate her sprinkler system. Dunbar recalls, "The fire came up and went around our house and burned everything else. Dave lost his home and saved mine. We owe him a lot." Southcott says, "I'd rather stay where we were together, fighting the fire, than running off trying to save my own place." Marvin Baldwin still has a home, and says he'll be forever grateful. "They were all down fighting, out fighting the fire while their own homes were burning. It's just unbelievable," he says. Schweikert explains, "We're doing it because we love our community. I don't think of it as being a hero. You know, I could be a hero to my wife if I had saved my house. You know, we lost a lot more than we saved." Southcott notes, "If we'd had more time, equipment, we probably could have saved a lot more homes. We're not heroes. We're just somebody doing a job that we enjoy doing - working in the community and helping the community. So we're really not heroes, I don't think." But others do think so. And the gratitude is comforting to firefighter Rachel Goddard. Goddard says, "We got little notes from a junior high class that said, 'We want more people like you.' And it hits you, it really does." She has one other reason to be thankful. Goddard says, "Seven people who lost their houses volunteer at this station. I'm the only one who has a house." With tears in her eyes, she adds, "I kind of feel guilty that my house is still there and theirs are gone. It's hard." Southcott says, "You never think when you go off to fight a fire that you're going to lose your place, and everything that was left there - that's the main thing. If we hadn't have saved any houses, it would have really hurt. But we were able to save some and it made up for it." Every night now in Cuyamaca, residents gather at the firehouse, one of the few buildings that survived. They meet to share a meal and offer encouragement. And that camaraderie is also helping to make this Thanksgiving something special. Schweikert says, "I couldn't be more proud of this department, for every effort they gave. I'm thankful everyone's alive - that's what we're here for, is to protect life... Every one of my crew made it through, my family made it through. The rest can be rebuilt." All seven of the Cuyamaca firefighters who lost their homes plan to rebuild. They're currently living in trailers, some on their burned-out properties. A relief fund has been set up, and while the firefighters say there's much to be thankful for, the town is certainly thankful for them. The chief of the Julian-Cuyamaca Fire Protection District has started a fund to benefit the families of firefighters who lost their homes in last month's Cedar Fire. That includes the seven from Cuyamaca as well as three from the neighboring Julian Fire Department.